A handful of now-legendary speaker designers (Rudy Bozak, Paul Klipsch, James B. Lansing, and others) did much to fuel the high-fidelity boom that occurred in this country immediately after World War II. In the 1 950s, a second wave of talented designers (perhaps best exemplified by Henry Kloss and Edgar Villchur, who together founded Acoustic research) rolled into the industry. Arnie Nudell is one of the most prominent speaker-designing entrepreneurs of the third wave. Not only has he been enormously successful, but he has helped carve out an industry segment that churns with both passion and controversy: high-end audio. Born in 1937 and raised in Los Angeles, Nudell was a dissertation away from his doctorate in nuclear physics at UCLA when he was sidetracked by a new scientific development. At precisely the time when the laser was discovered at Hughes Research Lab, Nudell held a summer job there. “I was so fascinated with this new field that I decided to stop my graduate work,” he recalls. For about five years in the mid-1960s, Nudell ran the laser lab at Litton Industries, where he did basic research and applied it by tying a pulse laser into an inertial navigation system. The marriage of these two elements resulted in a laser range-finder that helped American fighter pilots (notably those of the F-4D aircraft) bomb targets accurately on the first pass. But two longstanding passions, music and hi-fi , continued to play a key part in Nudell’s life. From an early age, he spent considerable time experimenting with new loudspeaker de signs. Eventually, one that he devised with a Litton colleague who shared his interest in music reproduction sounded just the right note, which led to the founding of Infinity Systems in 1968. In 1989, after 21 years at the helm of the company he had guided into the ranks of America’s top three speaker companies, Nudell left Infinity. He is now president of Genesis Technologies, the Colorado-based firm he founded in 1992 with Paul McGowan (the “P” in PS Audio), and he recently designed a line of speakers for Eosone, a new company whose products are being sold through the Best Buy chain. --When did music become an integral part of your life? When I was a little kid. I started playing the clarinet when I was about 6 years old, and I played semiprofessionally for a while. I played in the California All-Youth Symphony, and at one point I was considering going into music, although I wanted to be a conductor. But I rejected that idea at a very young age because, to be the conductor that I wanted to be, I’d have to have had perfect pitch, and I didn’t. I was first exposed to opera by my parents and their friends when I was about 8 or 9. They figured they were going to put me through one night of torture so that I would at least get exposed to it. So I went, and much to their surprise, I was the one who made them get all the opera tickets from then on. When they didn’t go, I went myself. Those were the days when the San Francisco Opera was coming down to Los Angeles, so I saw really good stuff. --I understand that you also began designing speakers early on. I started designing loudspeakers at 9 or 10. Through college I designed all kinds of loudspeakers. I spent hundreds and hundreds of hours in the anechoic chamber at UCLA and closed it down at 1 o’clock in the morning. I just stayed up all night and did measurements. When I was at the laser lab at Litton, I got together with an electronics guy, John Ulrick, who was designing servo systems for inertial navigation. He was a hi-fi junkie just like me and also loved music. We created a speaker using electrostatic panels and a servo woofer system. We didn’t think a full-range electrostatic could portray an orchestra very well. But with an electro static from about 100 Hz, and a servo woofer system that matched the electrostatic’s speed and distortion characteristics, we thought we would have something. --There was no such hybrid in those days, was there? No. There were no servo systems either. There had been writings about theoretical servo systems that could be done this way or that way, and we came up with our own way. We made them much better subsequently, but we found that, indeed, there was a huge improvement over any existing bass system. The servo system’s enclosure was about 20 inches per side, and it had an 18-inch woofer in it. We compared it with a four-thirds Klipschorn, a speaker 1.5x the size of a normal Klipschorn that I had made my self, also using an 18-inch woofer. In our judgment, the new system was far better. The four-thirds Klipschorn had previously been my reference, so we realized we had opened up a whole new area of bass reproduction. And new pricing territory. Your first speaker system, the Servo Statik, sold for about $2,000, which made it the most expensive loudspeaker of its day. It actually cost 30% or 40% more than the next most expensive model. What did people in a world that hadn’t known such a thing expect from a speaker that cost so much? First, that the loudspeaker had to perform in a totally different and better way than anything before it. Second, that the speaker’s fit and finish had to be in a league with the finest furniture. And that’s what we tried to achieve with the Servo Statik. We found that it sounded so radically different from other speakers that when people came in for a demonstration, it only took about five minutes for a sale. The money would just be plunked down. Yes, of course it surprised me. --These people weren’t buying the Servo Statik for prestige? They were not. The market has changed in that regard. 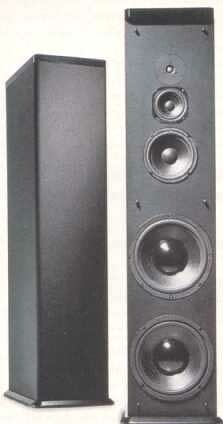 A lot of expensive very good- looking loudspeakers today sell because of prestige. With the introduction of the I in 1978, you pushed Infinity top price up to $20,000 per pair, At the same time, you were pushing at the bottom of the pricing envelope; the least expensive Infinity mod el cost about $200 a pair. Did any other speaker company attempt working at both ends of the price spectrum? I don’t think so. We were pushing in both directions. We tried to take the state-of-the-art technology we had developed for the top end as low as we could. Take the IRS, for example. 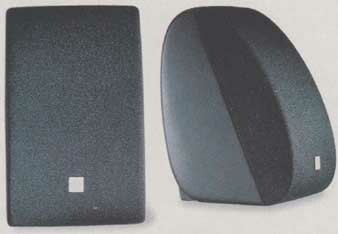 We developed the EMIT tweeter and the EMIM midrange, and we were the first to develop and use polypropylene in the United States. All of those things were originally done for the IRS, and all were brought down to much less expensive speakers. --Did Infinity build its own drivers? We designed all of our drivers. We built some, but many we had built elsewhere. --In developing the Servo Statik, how rigorously did you apply the lessons you learned during all those nights in the anechoic chamber? How stringent were you about measurements? 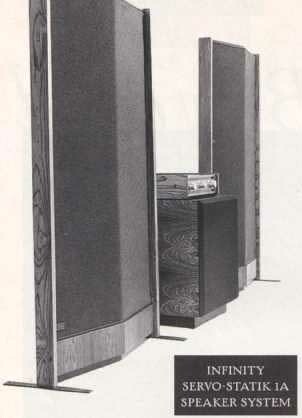 The Servo Statik was one of the first speakers CBS Labs tested for High Fidelity Magazine. It measured ±2 dB from 20 to 20,000 Hz. As long as that magazine used CBS Labs, nothing even came close. You’ve got to get the physics right. Then you spend a long time making it sound like music. The question is, what measurements are we talking about? And what correlation do those measurements have with performance? We still can’t answer the latter question, although we do understand it better now. We have many more measurements, and we have much better measurement techniques. All these help us a great deal in getting the design process started. But with regard to the final making of music, you throw the test instruments away and just listen. --Some people would argue that the ear is variable and can be imprecise at times, because of our moods or factors that we don’t understand. My ear is precise. Not that it doesn’t vary with mood or whatever, but there’s a constancy to my hearing that most people don’t have. I hear an orchestra in my head; I can hear a whole symphony orchestra and know exactly what those instruments sound like. And I know that if a loudspeaker sounds similar to what I hear in my head, then I’m getting close. That is invariant. --Is there never a time when something sounds different from day to day? --How much of your time is spent on the art—the listening—versus the science of design? Most of my time is spent trying to get that loudspeaker in front of me, which has passed all this pre-requisite scientific experimentation, to sound like music. And this takes a lot of time and patience. I can hear in my head what it should sound like, but then what do I do to the loudspeaker? What is the next step to make it sound like what I hear in my head? When I find out what that is, it could be a month later, or it could be six months. The first several changes you make may fail to solve a problem. That is correct. After all these years of de signing loudspeakers, however, I have a much better idea of what adjustment bends the sound in a particular way or moves it more the way I want. --In what areas do you find adjustments tend to be effective? After you've tended to what kind of drivers to use and their materials, as well as the cabinet and its geometry, the final thing is, of course, the crossover network. One of my philosophies is that all the drivers must be electrically in phase, never out of phase, and you need very fancy crossover networks to ensure this. And then there's the cross over components: There are very, very excellent inductors that have wonderful characteristics across the entire audio band, and there are others that have lousy characteristics. You have to be selective. At Genesis Technologies, we've designed and have made for us our own kind of capacitor. Most capacitors are featherweight, whereas ours weigh fractions of a pound because of the materials that we use. So if you talk about all these adjustments, you have to mention kinds of components, quality of components, and the kinds of crossover slopes available to you-or that you have to make up. We use very, very extensive computer modeling to help us in this quest. --If I asked you for a single key that would unlock your design philosophy, would I be leading you to oversimplify? I think it’s an oversimplification, but if I had to distill it down to one thing, I guess what I look for most in de signing a loudspeaker is harmonic integrity. Because without that, many of the other elements are impossible. Without harmonic integrity, it is very, very difficult to make a recorded instrument sound like a real instrument in space. --Infinity went beyond manufacturing loud speakers during your tenure. You had some interesting products in other component categories. All the people at Infinity were audio freaks, and we were interested in every aspect of audio. As a consequence, long before there was such a thing as a hybrid circuit, we developed one for the world's first commercial Class-D switching amplifier. FETs had never been dreamed of for use in preamplifiers in those days, yet we made one. And we made other electronic products. --You had the Black Widow tonearm. With the Black Widow, I think we came up with a way to solve a problem no one else had solved. There were these big, thick, heavy tonearms, but the compliance of cartridges at that time was getting higher and higher. The big, heavy tonearm did not match the higher-compliance cartridge, so we came up with a tapered carbon-fiber arm that had very low mass and very low friction. You could put a high-compliance cartridge in our arm, and it would sound like a totally different cartridge. You know, one year we sold more separate tonearms than anybody else in the world. --What were your goals in starting Genesis Technologies? One reason I left Infinity was that it had grown so huge. Many of my goals certainly had been met, but in the process of running such a gigantic company, I had less and less time to do the thing I loved most, designing high-end products. It became very frustrating. Genesis Technologies is not going to he another Infinity; it's not going to he so large. We're going to concentrate on the very highest end of audio and the tardiest reaches of what can be done, whether it be in speakers or anything else. We now have the Digital Lens, which took us two years to perfect. It's an electronic digital interface that goes between a CD player and a D/A converter. It does two things. First, by using a memory buffer, it stores each digital word and clocks it out very precise to eliminate jitter. Second, dither is added to create a 20 bit word, thereby triggering the 20-bit for mat in the D/A converter. --Did any startling new discovery help spawn Genesis Technologies? It was really a continuation of my thinking for many years, even when I was working at Litton: Perfecting all kinds of new materials for loud speakers and perfecting servo systems. Remember, we started that a long time ago. Genesis has servo amplifiers that go with most of our loudspeakers. It's taken us a long time, but we've finally perfected the servo bass system to where it's the best bass system in the world, bar none. We've come up with new rib bon technology. It not only has much lower distortion than previous designs, but we've also increased the dynamic range of ribbon and planar loudspeakers. And we've come up with some interesting new crossover components, such as the capacitors I mentioned earlier. --What were your design goals with Eosone? To take the technology that really works in high-end audio and try to bring that technology down to a point where it can be utilized in a less expensive product. All Eosone speakers are dipoles. This is probably the first time any lower-priced consumer speaker has been dipolar. One of the main advantages is that a dipole interacts with the room in a much more favorable way. It has a cardioid pattern from front to back, the back radiation being out of phase with the front, and the 1st side reflection is essentially zero. It allows you to hear, in a much better way, the character of the recording as opposed to sound bounced around the room, initially a lot, and then distorted by the room. In addition, since a dipole radiates sound to the rear, delayed maybe 30ms, the old problem of one sweet spot really doesn’t exist. Music and audio/video are now becoming family entertainment, so a family can gather around a system and enjoy it as much as the guy sitting right in front of it. Off to the left, off to the right, or even in the kitchen, the overall effect is much more enjoyable. --You've made it clear that your heart is with the high end. Why, then, have you bothered designing a line of popularly priced speakers at this point in your career? Since I produce some of the most expensive speakers in the world, certainly that part of me is satisfied. But it's still very gratifying to take this kind of sound and technology down to where greater numbers of people are able to enjoy it. It's a continuation of what I've been doing since the beginning of Infinity. --Did you design Eosone speakers specifically for home theater? For audio and home theater. They were designed for both. -- During your career in the audio industry, you've seen quadraphonic sound and time- delay wither on the vine. Do you think multichannel home music reproduction is finally going to be accepted? There's no doubt. And will that lead to more specialized speaker design? Yes, I think we'll get much more specialized kinds of loudspeakers that will enhance multichannel audio and home theater. --Dynamic range has always been important to you. Is this the frustrated conductor emerging? --[Laughs.] Probably, but if one is truly to create the sound of a symphony orchestra (and I'm just using that as an example be cause it's closest to ms heart), then the dynamic range of loudspeakers and of the whole audio chain has to be enormous And we're n getting to the point where we can see, in the distance, performance reminiscent of the dynamic range that I hear in Carnegie Hall, for instance. 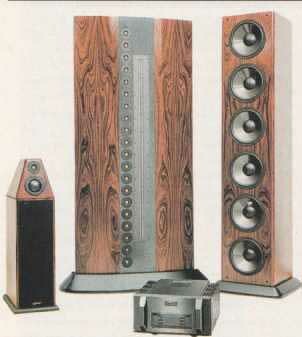 Digital technology has helped a lot, and some of the newer loudspeaker technology has helped a lot. --You've used the word "perfect" several times during our conversations. Is ‘perfection’ your goal in speaker design? Absolutely. It would he yen nice if, in my lifetime, we were able to make the breakthrough and come very close to perfect reproduction of a live symphony orchestra.